In the late 1800s Marie Curie and others began to study radioactive materials. These are materials that emit high energy rays. At the time it wasn’t clear what these were, but there were initially three known types, called alpha, beta and gamma. Just how these materials could emit such high energy rays was a mystery, but after careful study it became clear that the atoms in the material would emit these rays when they transmute (or decay) into another kind of atom. For example, Uranium-238 will undergo alpha decay to become Thorium-234. It was also found that the amount of radioactive material decreased over time in a very specific way. This is described by the equation below. Here N is the number of radioactive atoms remaining in the material, No is the initial number of atoms, and tau (the curvy t) is the average time before an atom will likely decay (known as the mean lifetime). 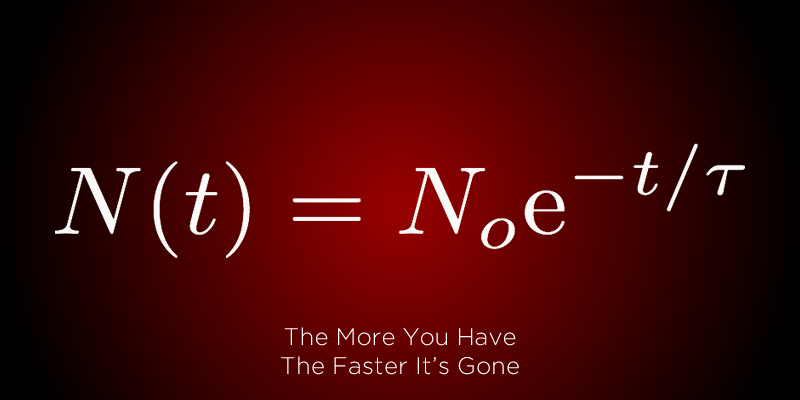 The e in the equation is a mathematical constant. What this equation describes is known as exponential decay. What Curie and others found was that radioactive materials follow this equation, with different isotopes (types of atoms) having different mean lifetimes. Given that radioactive materials decay in this way, it must be that the atoms decay randomly. We can’t determine when a particular radioactive atom might decay, we can only determine an average rate. To see why this is, imagine playing a game with a million coins. The rules of this game are simple. Each round every coin gets tossed once. Any coin that lands on tails gets to move to the next round. Any coin that lands on heads is eliminated from the game. Keep playing until you run out of coins. Assuming all of the coins are fair, each coin has a 50% chance of making the second round. Any coin that makes it to the second round has a 50% chance of making it to the third and so on. Even if a coin makes it to the 10th round (meaning it landed on tails ten times in a row) it still has only a 50% chance of making it to round 11. The fact that a particular coin has survived all the past rounds doesn’t make it any more or less likely to land on tails again. Each coin is completely random, and we have no idea when any particular coin might land on heads. On the whole, however, we can say some things about the outcome. While it is (remotely) possible that all the coins survive the first round, that isn’t very likely. We can be pretty confident that about 500,000 of the coins will make it to the second round, about 250,000 would make it to the third, and so on. It is very possible that 1 or 2 coins will survive to round 19. Even though we can’t predict the outcome of an individual coin, we can predict the collective outcome with a high degree of certainty. The coins as a whole will follow the equation below, with a mean lifetime of about 1.4 tosses. Because this equation is very accurate when applied to a large number of atoms, it can be used to determine how long a particular material has been undergoing decay, a method known as radiometric dating. Perhaps the most famous isotope used in this way is carbon-14. This isotope is generated at a fairly constant rate when cosmic rays strike nitrogen atoms in the upper atmosphere. Living things take in new carbon at a fairly regular pace, so they all have a fairly constant fraction of carbon-14. When things die they stop taking in new carbon, and the fraction of carbon-14 decays with a half-life of about 6,000 years. So we can measure the fraction of carbon-14 in something dead to determine when it was alive. Of course this dating method gets less accurate as there are fewer radioactive atoms remaining, and this means there’s an effective limit to how far back we can date something with a particular isotope. For carbon-14 that’s about 60,000 years. Other isotopes, such as uranium-lead dating can determine the age of rocks billions of years old (give or take a few million years). Meteorites, for example, have been dated to be about 4.5 billion years old. Combined with datings of the oldest rocks on Earth we now know that this is also the age of the Earth. Radioactive decay is also used to identify a particular type of supernova known as type 1a. Like all supernovae they brighten very quickly, but they grow dimmer exponentially at a very specific rate. This is due to the radioactive decay of nickel and cobalt produced in the star’s core. Type 1a supernovae can be distinguished from other supernova types because of this rate of decay. This is extremely useful because these supernova also have a consistent maximum brightness, which means you can determine how far away they are by measuring how bright they appear. We’ve observed such supernovae in galaxies billions of light years away. With an understanding of radioactive decay we have come to know that the Earth is not thousands but billions of years old. We know that our galaxy is only one in a sea of galaxies billions of light years across. With the toss of a hypothetical coin we have a tool to understand the true scale of the universe. But within this equation lies something deeper and more subtle. The equations works because the atoms decay at a random rate. It was thought that the atoms were random in the way coins are random. Coins are random because the way we toss coins varies slightly, and this makes the outcome unpredictable. When radioactivity was first discovered, it was thought the same was true for the atoms. Surely there must be some unknown mechanism that caused a particular atom to decay. But turns out this isn’t the case. There is no clockwork mechanism. As we later discovered, Newtonian physics doesn’t apply to the inner workings of an atom. We didn’t know it at the time, but our Newtonian view of the universe was already in a state of decay. Next Time: Maxwell’s equations were a triumph, unifying electricity, magnetism and light in a single elegant theory. But according to this theory, atoms can’t possibly exist.